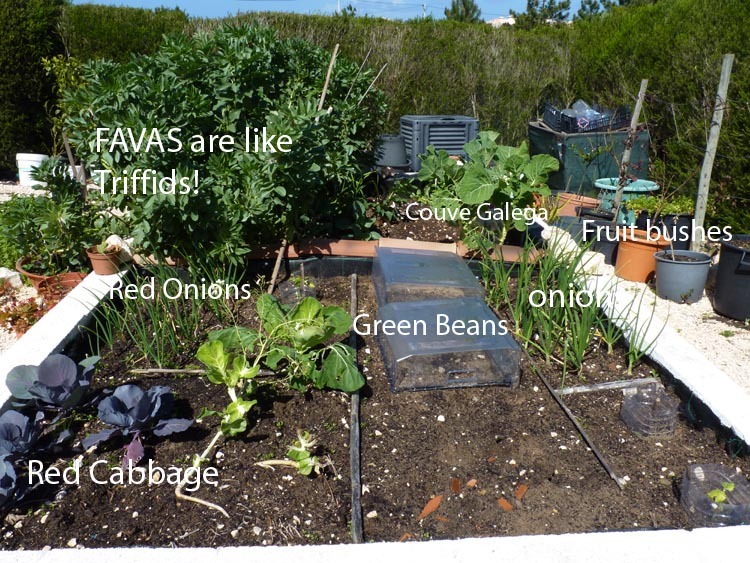 This year I plan to photograph and record what’s growing in my humble vegetable garden on the 19th of each month. This will give me a better idea of what’s growing when, and how well. Hopefully, it will act as a record for next year and I can learn from my successes and failures. The Portuguese cabbages (Couve Galega) which I use to make Caldo Verde Soup are now over 2′ tall. I love the way they grow skywards – a great space-saving crop for a small plot. 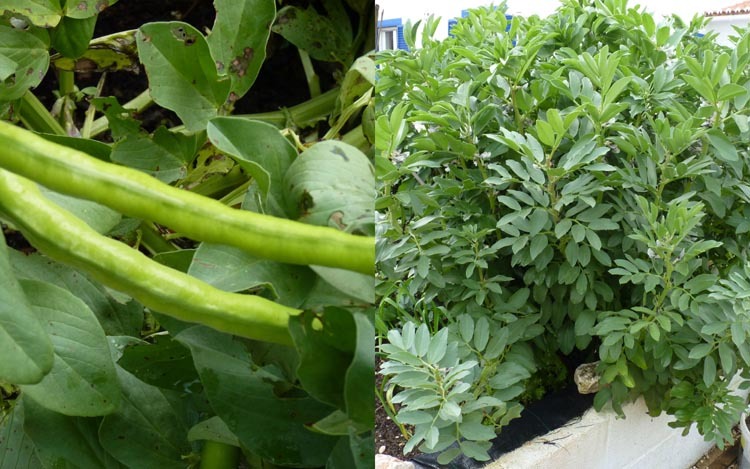 My favas (broad beans) planted from seed on the 24/10/2012 are now over 2’6″ tall. In fact I’ve pinched the tops out of some of them so their energy goes into the beans and not into leaves, stalks and even more flowers. There are loads of pods and we will be eating our first feed of beans this coming week. Echalotes (shallots) – I had not planned on growing shallots until a chance meeting at the supermarket with an old gardening buddy changed my mind. Clutching a bag of shallots (they are not readily available here) he asked me if I grew them. When he discovered I’d never even tried, he selected a bag from the shelf and explained you grew shallots the same way as garlic ie you plant one clove and it multiplies. I nodded enthusiastically thinking errr but I’ve never been successful growing garlic. His wife, bored with the shallot and garlic discussion dragged him away to continue shopping. Clutching the bag of shallots I was about to return them to the shelf when he reappeared. Apparently I had to soak them overnight before planting. I bought the shallots, which he assured me had not been “treated”, returned home and duly left them soaking in a tray of water until the following day. Mr. Piglet perplexed that I was soaking the bulbs, told me they would rot. I relayed the instructions I’d been given to which Mr. Piglet retorted. “If he’d had told you to stick your head in gas oven…blah blah blah…” (I ceased listening) but then thought, maybe he had a point and wished I’d only soaked half of them. 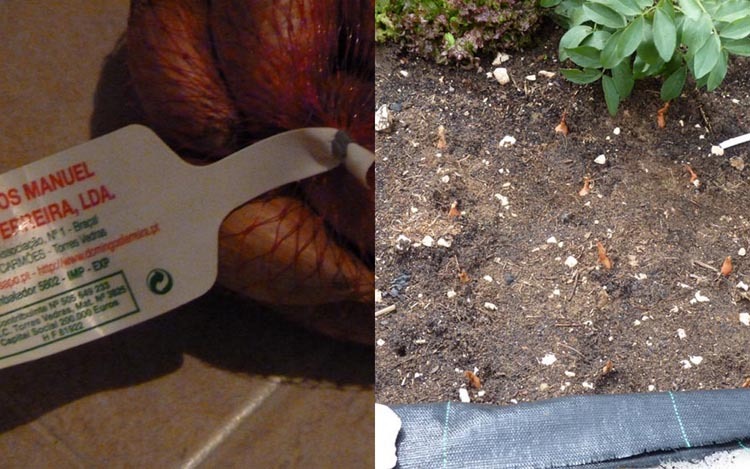 Does you soak onion or clove bulbs before planting? Do you like my recycled freezer draws? I rescued these to reuse as clochés. They are now protecting my french beans planted on the 13/03/13. We went to the market on Monday and I bought four more cherry tomato plants and two red pepper plants. The stall holder has long ceased trying to sell me a dozen of anything and just smiles at my requests. Perhaps I will bake him a cake for his kindness. This year due to limited growing space I decided to try something new and see which plants adapt well to growing in containers. 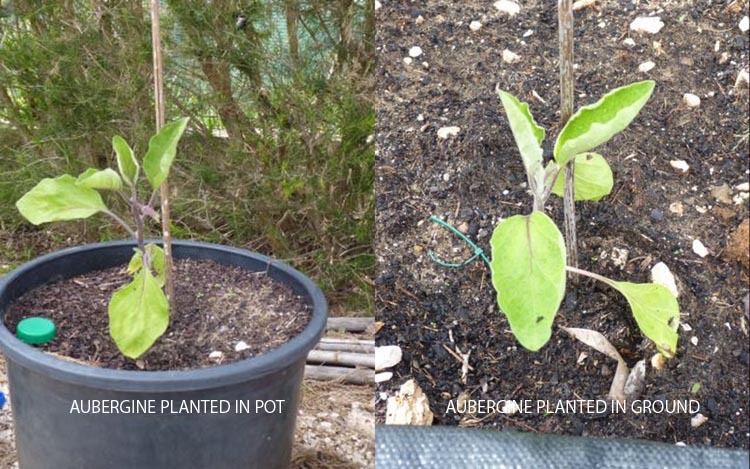 Although I grew some veg in containers last year, with varying degrees of success, the plan this year is that when I plant for example peppers, cucumbers or aubergines in my raised garden, I will plant a sample one in a pot at the same time. This will enable me to make a direct comparison. Studying the photographs from February the Aubergines have hardly grown in a month. 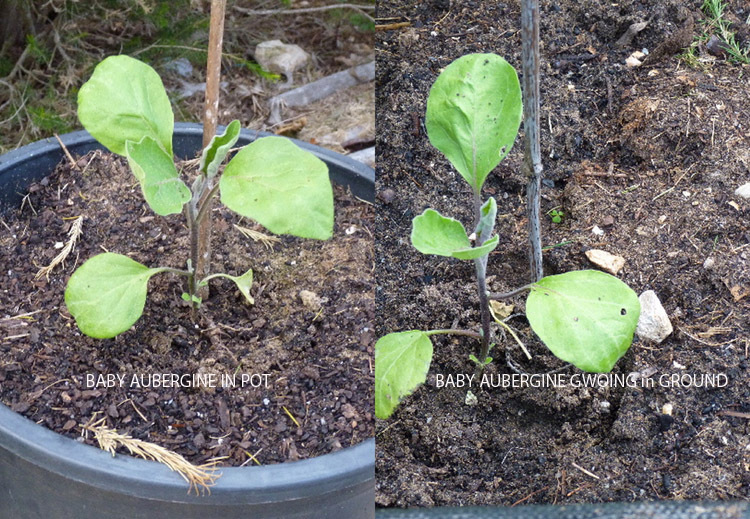 However, the aubergine in the pot does look slightly healthier and even has a solitary bud. The cucumbers are a non-starter. The baby plugs in the pot were unfortunately eaten by slugs while we were away in France while the one in the ground and clinging to life by its fingernails looks like it is at death’s door. 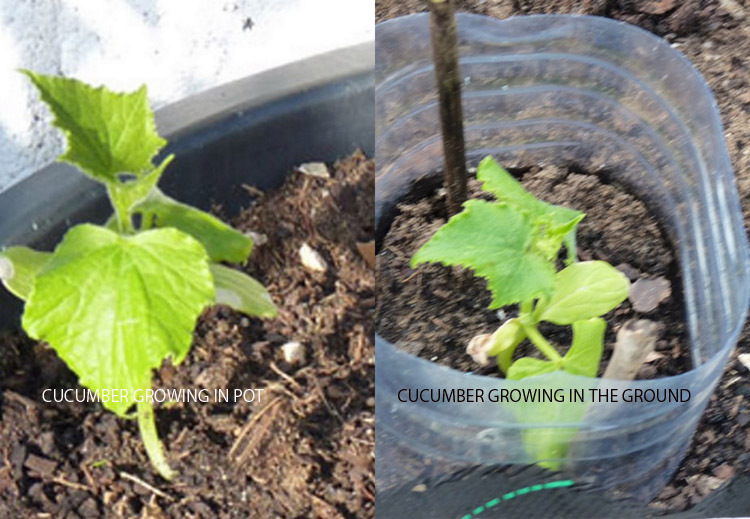 On a positive note, several seedlings (parentage unknown) have appeared in the pot as if by magic; they are either melons, cucumbers or the dreaded zucchini! The green peppers are also not faring well regardless of location. One was eaten by slugs and the remaining two, pictured below, are turning yellow. I’m not sure if this is because the compost was to strong for seedlings? Maybe but it was certainly not lack of nutrients. I bought this cherry tomato plant from the market as a more established plant in February. I actually asked the guy for a tomate cerveja (beer) rather than a tomate cereja (cherry). Easily confused, there’s only one letter difference! At least my mistake made him laugh and he corrected me! Considering the cold nights, gales and lashings of rain it has survived well. The Plum tomato planted at the same time fell victim to blight as did all the other seedlings a friend gave me. All had to be quickly disposed of before it spread. 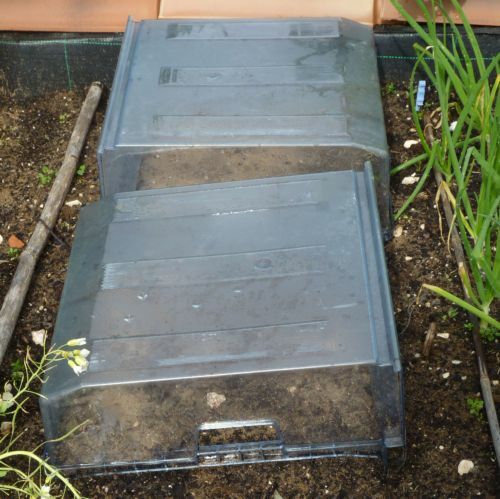 I only planted the baby leaf salad seeds on the 13/03, watered and then covered with clear plastic to assist germination. When I lifted the plastic sheet to take a photograph just six days later I was astounded to find the seeds had already germinated. That or I’m growing a healthy crop of weeds! The container is a recycled the washing-up bowl with a crack in the bottom. Useless a bowl but a perfect container for growing salad. Last month there was no sign of life and I thought my rhubarb had finally died. 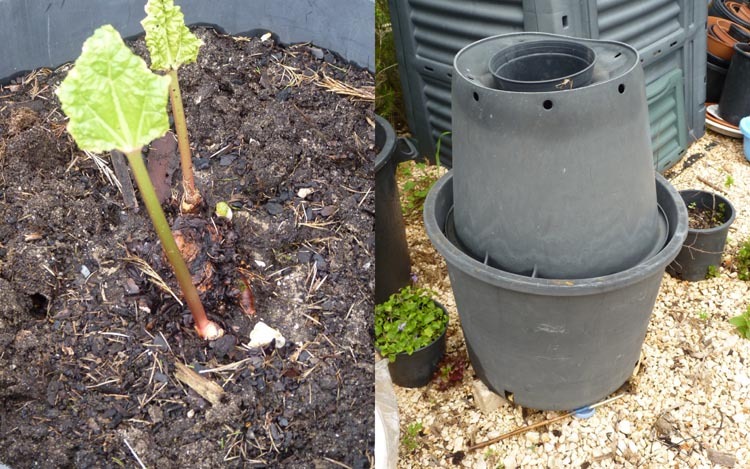 But no, I added my home-made rhubarb forcer (a flower pot which Mr. Piglet burnt a hole in the bottom) and another pot inserted inside the large hole to cut out the light. And we have the first shoots of rhubarb. The lime tree is producing new leaves but is stll plagued by citrus leaf miner. My two baby peach trees which I am growing in pots continue to do well. 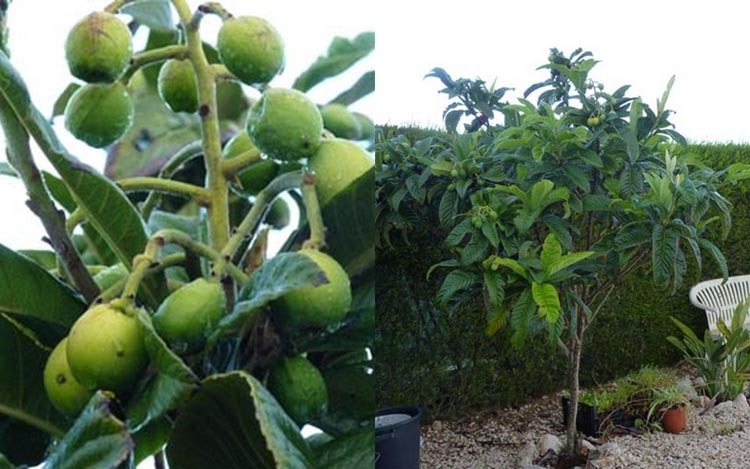 Next month we will be making a graft from the original tree to encourage them to fruit. 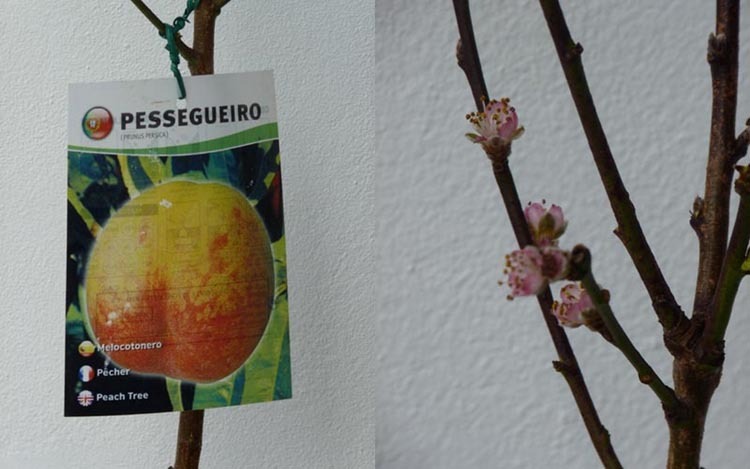 We went to the market last Monday and I could not resist buying this darling little peach tree. I asked the stall-holder, in my best Portuguese, if the tree would have fruit next year. He looked at me in surprise, pointed to the blossom and indicated I would have fruit this year! I’m a little dubious, but then blossom does turn to fruit. I then asked him if I could plant it in a pot (vaso) and he vigorously nodded his head in agreement. However, I have the feeling if I’d asked him if I could plant it in the toilet or on the moon he would probably have said yes! He kept telling me the variety was Muito Bom (very good) so as it was only €6 bought it. 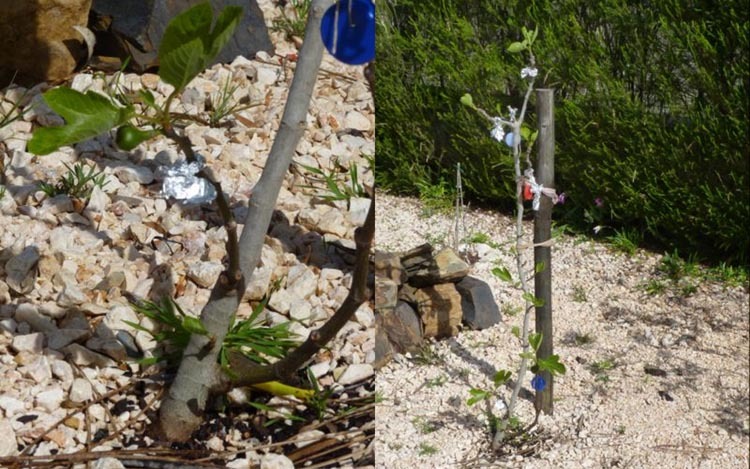 My other peach trees are a long way from bearing fruit as they were grown from a stone – so what did I have to lose? Last year I planted this fig tree in a large pot. However, after research on Google revealed its aggressive root system did not lend itself to planting in containers I transplanted directly in the ground. Shortly afterwards it lost all its leaves so I figured it was dead. However just before we went to France, at the end of February, I noticed much to my surprise there were a few tiny figs and new leaf shoots. I was overjoyed until looking out of the window I noticed a pair of green finches pecking away at my little tree! I immediately decorated the tree with strips of silver paper and bottle tops hanging from string. We have a good crop of nesperas this year. Never ate these in England – what do you make from them? The orange tree is JUST producing an abundance of tiny new leaves. Hopefully it will blossom and have fruit this year! 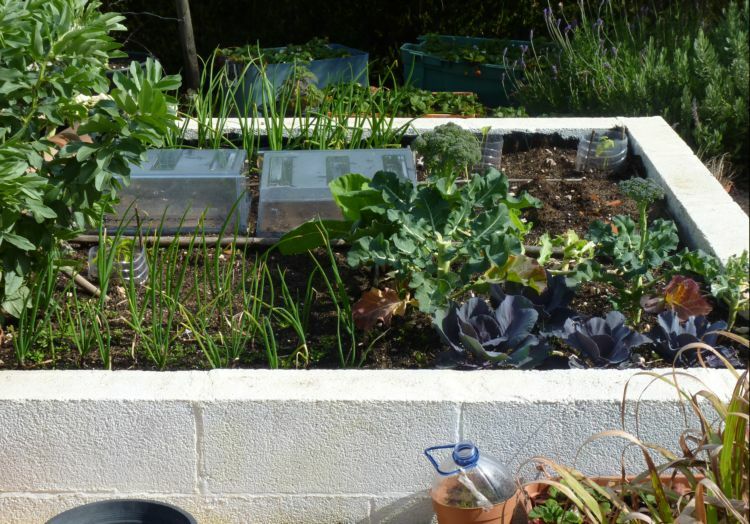 Aubergines, green AND red peppers, tomatoes, cucumber, squash, melon cabbages, lettuce, onions (they look like chives), broccoli, cauliflower, runner beans, spinach, strawberry plants, fruit trees and bushes. Oh my goodness, PiP…I am entranced by your enchanted garden!!! And jealous!!! You’ve done so much…and I apologize for not coming to see your recent posts. 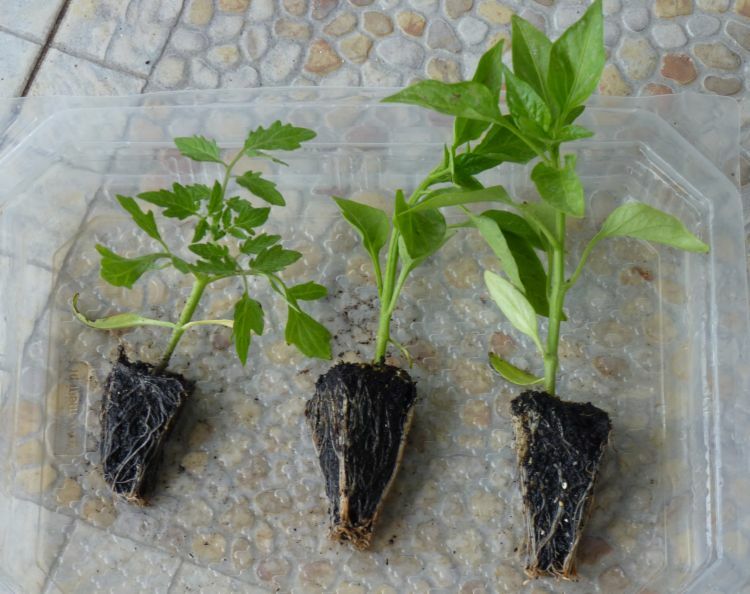 What a great idea to plant in container and in the ground…so you will be able to compare the yields and see which is better for you. 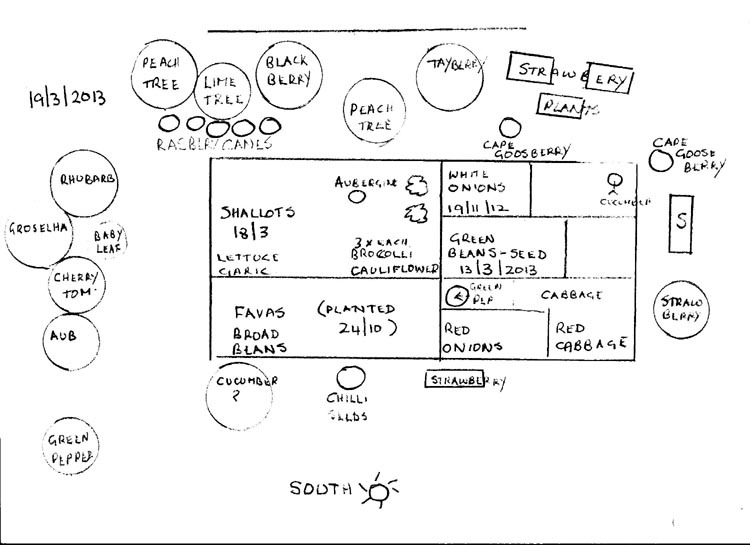 Love your garden sketch…can’t wait to see how the real thing progresses. When my kids were young and we had 100 blueberry bushes in our backyard, I used to pay them a penny a bug…and they would go around with a cup of soapy water…flicking whatever leaf-sucking insects were around at the time…they had fun, made some money and our blueberry bushes prospered. I have had much success growing tomatoes and peppers in pots. Not having a plot of my own to plant in I had a nice balcony garden in my condo which even included praying mantis’!! I had several tomato plants and about 5 or 6 pepper plants. I did lettuce at one point, too. it was fun! I truly am envious of your garden and LOVE reading about it. OH about the slugs. My mother swears by bowls of beer to handle the slugs. Not pretty, but it works. Hi KH, any tips re growing peppers in pots gratefully rec’d. Is it about the same as tomatoes? I need to try the beer technique. 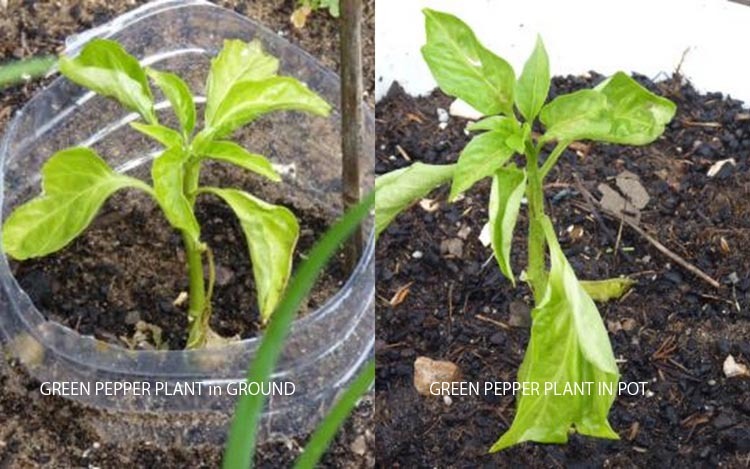 The pigging slugs or snails have eaten my remaining green pepper plant in the ground. That’s tw I’ve lost now! I’ve ben really succesful in the past growing lettuce in wide pots. I just pick the leaves only as I need them. You’ve got such great variety in a small space. Enjoy. The freezer drawers are a great idea! 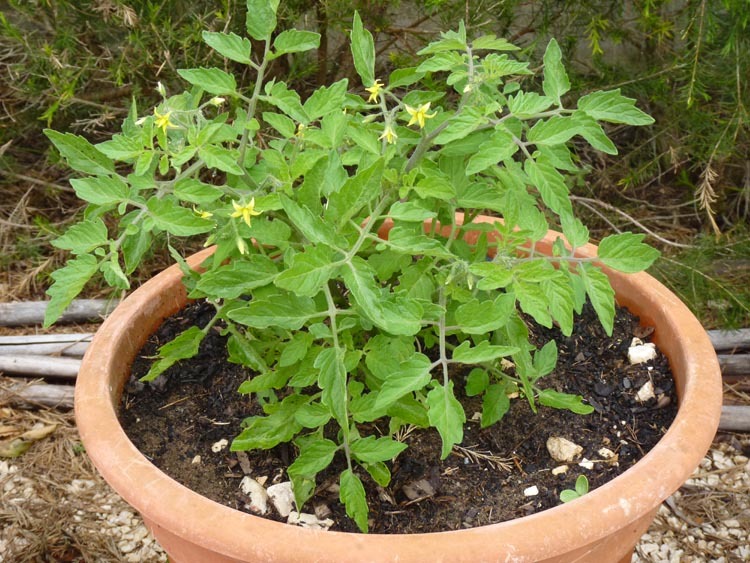 I will be trying to grow tomatoes in a pot this summer as I have no real garden space (what size pot will I need?) Thanks. Thanks – can regular tomatoes be grown that way as well or does it have to be cherry type? To be honest I’ve had more success with chrry tomatoes in Containers than other types. But if this is your first year, maybe buy a couple of different varieties and se how you get on. I just found the yield better and cherry tomatoes did not take so long to grow and turn red 🙂 Maybe your garden centre can best advise. You will also need some method of supporting them once they get bigger. ie canes or trellis. Some tomato varieties grow really tall so IMHO may not be best for pots, but others may disagree. 🙂 what do you think folks? Not sure which type I’ll try at this point but thanks for the honest info. What a great idea to plant the same thing in a pot in the ground to see what fares better. We have 2 Loquot trees (Nesperas) and they give loads of fruit which we eat, give away, make jam and even make liqueur from them. The fig tree will probably be ok. We have one that keeps on giving fruit every year since we moved here, (still have fruit in the tree right now) and I never water it. Hi Sami, thanks for the spelling of of nespera…I always mispell it 😦 Jam sounds a good idea. I’ve tried for years to grow fig trees, I can’t understand WHY if they grow wild they won’t grow for me. Perhaps I kill them with love? Interesting – I am now inspired to grow a few things on the balcony until we find a new house with a garden, hopefully I’ll have more success than with my veg. garden in the UK. Pity there are slugs here too though! You are so well organised Pip. I am impressed with the ground plan. I have a nespra tree in my garden but don’t like the fruit much. I am told it makes good chutney so may try making it if I can find a recipe. Wow, this is indeed very heartening and enterprising. Your enegy clearly resides here.Do you use inorganic fertilisers too? Hi Shakti, yep I have a compost heap and I also use manure. I do use non organic fertilizer for anything in pots as it is more difficult to monitor. 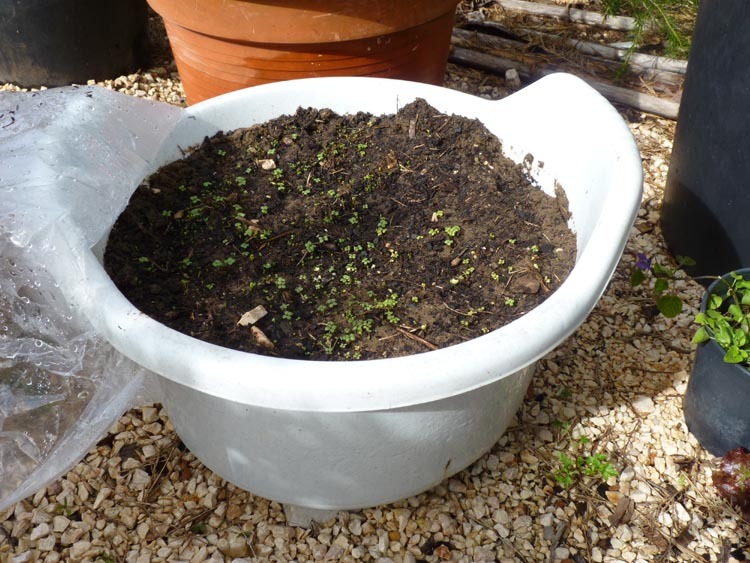 The soil in the pots though started off as a mixture from the compost heap and bought compost…so I’m getting there. I am SO envious of you, here in NW Montana we still have freezing nights and even snow which we haven’t had much of all winter until now!! I also grow Couve Galega and love it which I learned about when in Portugal. I have tomatoes growing under lights in the house, as well as cabbages, leeks, peas so they will be ready to plant out when the weather breaks. In Oregon we put beer bowls in the garden and they did kill slugs. 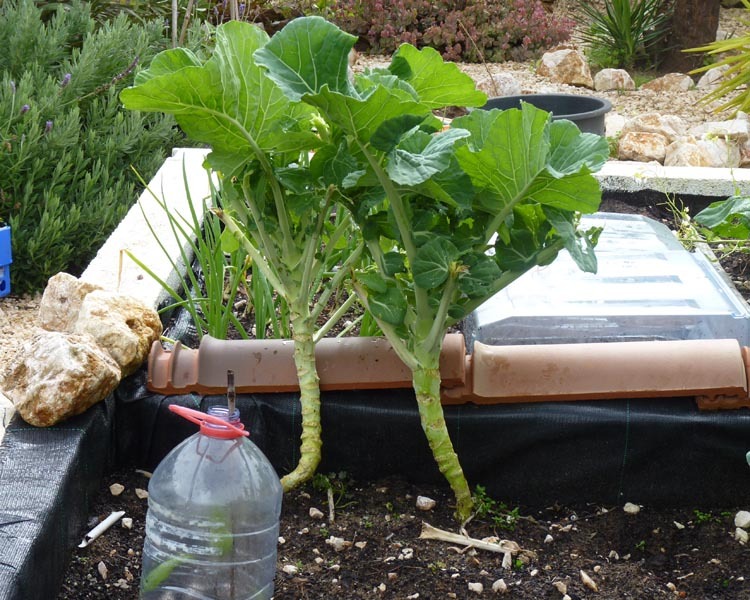 Also you can put collars around cabbage plants and tender stuff (like toilet roll insides) to help keep the bugs, slugs and cutworms from chomping them off. Good luck with your garden, I hope it doesn’t rain too much for the tomatoes, as this is where blight will come in. Putting egg shells in the potting mix will help if you get blossom end rot and it prevents that as the calcium leeches into the soil. Valerie http:\\mypassionforportugal.com. I guess you mean capsicum when you talk about green peppers? I find in my location they seem to be slow to develop and so I moved one into a pot after its first year, (they are short lived perennials). It did well but I still only got three or four good sized fruit from it, it is still fruiting but as it is now coming into Autumn here it may be the last of it. The pot I put it in had a water reservoir in the base so it was watered from the bottom up and I had to wrap the palnt up in chicken wire to keep the possums out. Hi dzyn2, yep capsicums 🙂 I left mine in the ground from last summer and somehow they overwintered and were still fruiting. However as the fruit were so small I eventually pulled them up to make room for something else. Great post. I wish I could make a detailed interesting and enjoyable gardening update post like yours. Your fruit trees are pretty and make my mouth water. I hope they’ll produce well for you. The Nespra sounds interesting. I’m going to look it up and see if maybe we have something similar that they sell around here. 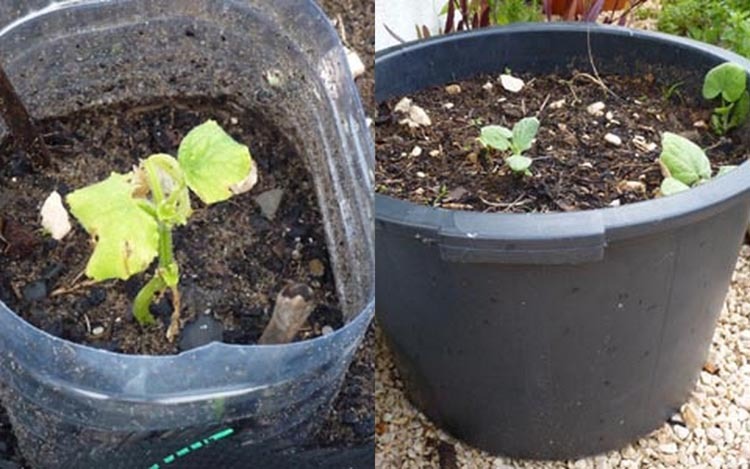 I have taken your advice and instead of putting the eggshells on the compost heap I put them round the little cucumber plant which is struggling for life. I’m impressed and slightly envious. Would love to have lime trees. It’s too cold here unless I could bring them in during the winter. Sigh. Love your veg bed! ANd yes, great idea about the record keeping. 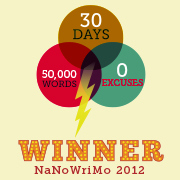 I did that last year–for one month! I just need to be more organised and have more time to stay on top of it. And maybe a helper. Actually as much as I love gardening and love growing my own, I think last year’s massive potato/tom blight and then the endless rain really crushed my new gardener’s aspirations. I’m letting the beds ‘rest’ this year. Apart from the garlic that has grown up from what I thought were rotted bulbs! I think this project of mine may be a little ambitious and time consuming editing photos etc. Recording everything in such detail on wet winter afternoons, but not when I would like to be down the beach. Blight was a big problem last year for me, and this year I had to throw loads of baby tomato plants awy as they had the disease. Last year it was the potatoes that caused the problem and because I was awy when the first siggns appeared, by the time I returned it had really taken hold. Visiting your blog after a gap. I find that your hard work and planning is beginning to pay. I understand how much time effort and energy is required to make the garden. My garden too is disarray due to lack of time and energy. I am doing in fits and spurts . Now summer heat is not helping at all in India. 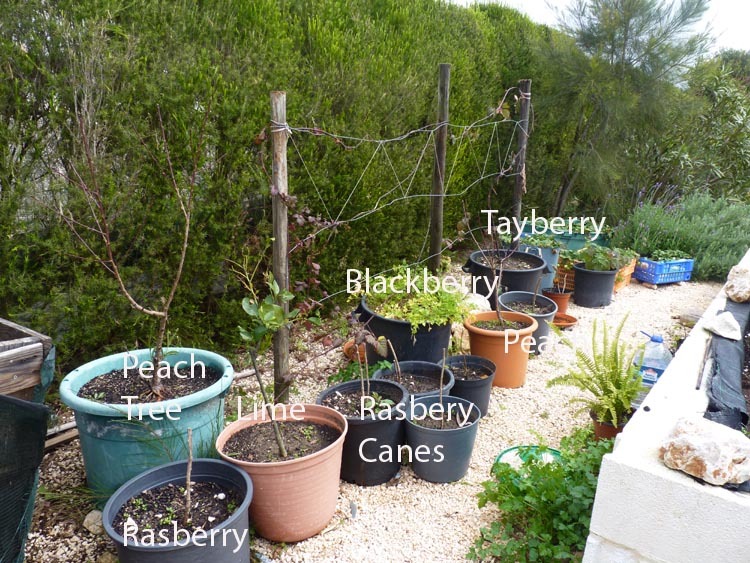 How is your potted blackberry producing? I must admit that I laughed when I saw the canes being sold at the market on the weekend as we spend a huge proportion of our time just trying to eradicate the blighters as they will cover anything and everything if they get 1/2 a chance. But I am guessing the cultivated brambles are specially bred for larger or sweeter fruit? Although I didn’t buy any blackberries, I did come home witha feijoa sapling. Has anyone had any luck with them? Love the garden. Great idea about taking a pic on the same day each month as a journal. Should try that. :). Gardens will do that to you.